An unconventional visitor came to the shop from the south. The young Reachwoman came with a dark presence, and glares from the townsfolk and the crows alike. She spoke of a Hagraven who held a powerful old staff that she coveted. The hagraven lived with a few of her briarhearts up high in the mountains, and she was able to overcome the strongest of warriors to control them. She wants the staff for herself, and looked outward for assistance. Blackwing took the job, but the Twisted Staff may be worth breaking the contract and passing onto the Compendium. A problem came to the shop. A young man came with a deep worry in his eyes. He was going to propose to his love, and went to his family’s tomb to retrieve the chest that contained his family’s treasure. When he arrived he could see the signs of a recent break in. The young fool would go on to explain that he may have mentioned what was in the tomb and where during a night of drinking a couple nights before. He would provide rather poor descriptions of a couple big Nords who were in the bar with him, and a location of the tomb. He has hired Blackwing to retrieve the jewels. A very old and wizened man as well as a silent and worried, looking young Nord woman, who he says is his niece came to the shop in order in order to browse any potions, elixirs or herbs that they might have in their stores. Defeated looking after not finding what he needed, the old man claims that he is seeking a cure for the disease that his niece is afflicted with. With a small flash of light, the normal looking woman essentially transforms into an extremely sickly frail creature, who can barely keep her feet. She is pale, paler than the normal nord, and extremely thin and seemingly wasting away. He explains that she is not able to absorb nutrition. 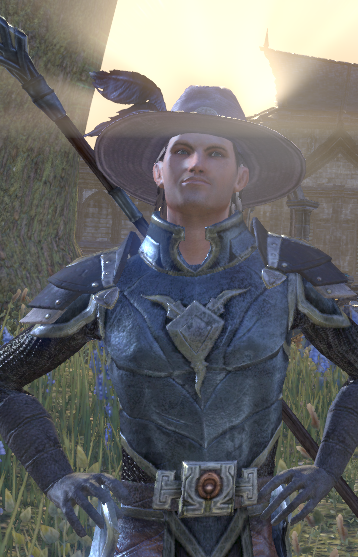 The old man names himself as Klaus, and explains that he's been looking for a rare herb called Assassin's Root (non cannon), which its host plant is a special type of rare Strangler found in the wilds of Craglorn. Roran would like to sign up to help with every one of these, because every job needs a healer, and he likes to help.